Example of what a Traveler might look like. Many people are wanderers, but the Traveler has developed movement into an art. The grace and ease with which Travelers walk across roads and battlefields leaves onlookers in awe; they are the undisputed rulers of the roads. 1st Circle – Wanderer’s Gait (Ex): Your constant travels have lent a certain jump to your step. Choose either your KOM or KDM. You gain a bonus to your land speed equal to that ability modifier multiplied by 5 ft. For example, a 1st level Monk who multiclassed into this track and chose KOM, with a Wisdom score of 18, would gain a 20 ft increase to their land speed. Additionally, diagonal movement only counts as 1 square of movement for you, instead of 1.5. 2nd Circle – Skirmisher (Ex): Movement is in your blood, even in the heat of battle. You gain either a bonus to damage rolls, and either a deflection bonus to AC or a fury bonus to attack rolls, equal to half the circles you have in this track. At the end of every [Round] in which you move 40 ft or more you may increase the bonus to damage rolls and either deflection AC or fury attack by 1. This means that you may select a bonus other than the one you chose originally to increase in any given [Round]. For example, if you chose to gain a fury bonus to attack rolls equal to half your circles in this track, you may still choose to give yourself a +1 deflection bonus to AC in subsequent [Rounds]. In this case, you gain an increase to that statistic, not a bonus (meaning it will not stack with other fury or deflection bonuses, respectively). You may benefit from these cumulative bonuses a number of times equal to the number of circles you have in this track. Additionally, you gain a climb and swim speed of 20 ft.
3rd Circle – Fleet of Foot (Ex): The time you spend on the road have made you nimbler and heightened your senses. You may ignore difficult terrain when moving and gain a +2 bonus to Perception and Stealth checks. Additionally, you gain a bonus to your Awareness score equal to your circles in this track. Additionally, the bonus to land speed you gain from Wanderer’s Gait increases to your KOM or KDM multiplied by 10 ft.
4th Circle – Careful Tread (SLA): One per [Scene], you may cast either greater invisibility or freedom of movement, as a spell like ability, on yourself only. Vicious Alacrity (Ex): You use your momentum to pulverize your opponents, leaving them staggering and weakened. When you make an attack in any [Round] in which you have moved 60 ft or more, opponents you hit must make a Fortitude save (DC of 10 + 1/2 your level + your KOM) gain the [Battered] and [Bleeding] conditions for 3 [Rounds] each. Revitalizing Dash (Ex): At the end of any [Round] in which you have moved 60 ft or more, you may heal yourself hit points equal to two times your KDM and remove one condition of your choice from yourself. 5th Circle – Way of the Road (Su): Your wanderings have made you constantly on the alert – catching you by surprise is nigh impossible. You gain [Immunity] to the [Flat-footed] condition and may add your circles in this track to Initiative checks. Additionally, the bonus to land speed you gain from Wanderer’s Gait and Fleet of Foot now extends to all modes of movement you have. 6th Circle – Seasoned Traveler (Ex): You may take a number of additional five foot steps per [Round] equal to the number of circles you have in this track. Additionally, twice per [Encounter], in any [Round] in which the total distance you move is equal to or greater than 80 ft, and you would gain a +1 increase to either your fury bonus to attack rolls or your deflection bonus to AC, and a +1 bonus to damage rolls, from your Skimisher ability, you instead gain a +2 increase to either your fury bonus to attack rolls or your deflection bonus to AC, and a +2 bonus to damage rolls. This still counts as one use of the Skirmisher ability (allowing the numerical value of the bonus you gain to exceed the number of circles you have in this track, even though the uses of the ability do not). 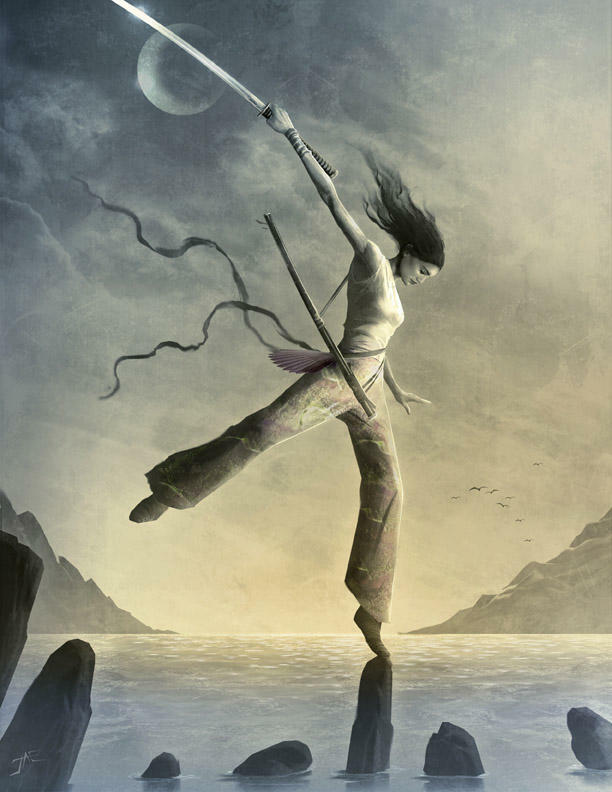 7th Circle – Running River (Ex): Your movement is as fluid, nimble, and powerful as rushing water. Whenever you move into and out of a square that is adjacent to an opponent, that opponent must make a Fortitude save (DC 10 + 1/2 your level + your KOM) or be [Knocked down]. Aside from the diagonal movement thing, I really really like it. The 6th Circle seems to imply that you don't need to choose between AC or attack, as it says in 2nd. Also, can you switch between the 2nd circle bonuses as you go? So at 2nd circle, at 2 rounds you get to a +2 damage and +2 AC, but at 4 rounds can you get +2 damage, +2 AC, +2 attack? seasoned traveller seems off to me. Its wording is rather confusing, and being able to increase the deflection bonus above 7 is probably a bad idea, as 7 is already very high. Similarly, the extra attack bonus is very powerful. The attack bonus being untyped is problematic, as you could stack it with either fury bonuses or precision damage and cause problems. 1) What's wrong with the diagonal movement? 2) I'll fix the wording on 6th circle immediately. 3) As for switching bonuses from [Round] to [Round], yes, I intended it that way. It provides the option of creating more flexible combinations, tailoring the bonuses you get to your tastse. 1) Dammit, I could have sworn I had typed the attack bonus as [Precision]. I'll go back and do that. 2) Yes, the bonuses can increase above 7, but it's hard. The typical combat is going to last about 4 [Rounds], and the tactical applications of circling the battlefield 80 ft each [Round] are dubious at best (and you'll be provoking AoOs as you go). I think that the scaling won't get out of hand. 1) As far as I know, there is no [precision] accuracy, only [precision] damage. Even if there is, there is nothing forbidding [precision] damage with [precision] accuracy. 2) I can't tell how it might scale, because the ability is really, really confusing to read. I'd also consider giving burrowing movement when you give them climbing and swimming. Not many actually use burrowing, and it's a great way to stay way from flying opponents. OK, now I remember why I didn't give them a [Precision] bonus to attack rolls - now I recall checking and finding out that [Precison] was a strictly damage-related term. I suppose I could make it a fury bonus, but that doesn't quite fit with the track's fluff. I'll try to clarify the wording on 6th circle. EDIT: Reworded 2nd and 6th circle. Is it clearer now? I don't know, I stayed away from flight, so I think I'm going to stay away from burrowing as well. ah, I see what its doing now. That scales oddly, to say the least. Yes, I'll admit it's unusual, but is there anything that would be problematic with it? Also, should I make the attack bonus a fury bonus? I'm not liking the idea, but I'm not sure how else I can dodge stacking problems. You will start off every battle weaker, and as you level it will become increasingly difficult to get up to par, much less have an amortized ability that is correct. Its a very odd balance point, and I'm not really comfortable with it. I agree it doesn't feel like a fury bonus, but I don't see what else to do about it without defining an entire ruleset for precision attack bonus. The increasing combat capability was the intention, designed to emulate gaining momentum as you move faster and faster around the battlefield. I agree that it is odd, but I think it balances out - you start with a disadvantage at the beginning of combat, and have an advantage by the time it's over. All right, fury it is. But your combat gains and effectiveness are only loosely tied to level. Sure, the cap raises, but that becomes less and less important as the you level, since the battle has to be longer and longer for it to matter, and you have the increased effects for less and less time. Then how about second circle reads, "You gain either a +3 fury bonus to attack rolls or a +3 deflection bonus to AC, and a +3 bonus to damage rolls. Additionally, in every [Round] in which the total distance you move is equal to or greater than 40 ft, you gain a +1 bonus to damage rolls, and a +1 increase to either your deflection AC or your fury bonus to attack rolls, all for the remainder of the [Encounter]. You may benefit from Skirmisher a number of times equal to half the circles you have in this track (with the bonus stacking each time). And sixth circle reads, "You may take a number of additional five foot steps per [Round] equal to the number of circles you have in this track. Additionally, in every [Round] in which the total distance you move is equal to or greater than 80 ft, and you would gain a +1 increase to either your fury bonus to attack rolls or your deflection bonus to AC, and a +1 bonus to damage rolls, from your Skimisher ability, you instead gain a +2 increase to either your fury bonus to attack rolls or your deflection bonus to AC, and a +2 bonus to damage rolls. You may still only benefit from Skirmisher a total number of times equal to half the number of circles in this track, but the numerical value of the accumulating bonus itself may exceed half the number of circles you have in this track (for example, at 7th circle, you may benefit from Skirmisher 3 times, but you may accumulate a +6 bonus by moving 80 ft each time you gain it). This grants more of a flat, dependable bonus, while still allowing the character to gain momentum as the combat continues. Well, that does start too high for 2nd circle. I'd just have them be a flat bonus, and activate it only on turns where they move enough. nothing else builds in power over several rounds like that, and I'm not sure that it would ever be a proper thing to do, at least not without clearly established baselines on how it works. If you must have the build up, then just have it be a 2 stage thing- get one level as baseline, and boost it when you have moved enough. That removed issues of needing really long battles to build up to the level expected values. Too high for second circle? Compare to Tactical Insight's first circle. And I wouldn't say you need "really long battles" - by the end of round 1, you're already on par with 4th circle (or 5th circle once 6th circle kicks in), and on par with 5th by the end of round two (or 7th once 6th circle kicks in). The rest is extra. Anyway, I always like to try something new when I design a track, and I don't share your opinion that a buildup over several rounds is problematic. I think it works fairly nicely, and I'm not really willing to sacrifice what I consider to be one of the central concepts of the thing.